A bit of an off-the-wall post today, but I think it is past due. First, falling down the steps right after Thanksgiving, and then having the flu-that-never-ends right after Christmas, has kept me away from my other obsession, Gelli printing. A few days ago, I couldn't stand it any longer, so I got out all my Gelli printing supplies, put on an Eric Clapton (with Cream) CD, and went to work with my Gelli plate and acrylics. I know I could continue to work with my Gelli Plate until the cows come home. But, I realize that I really need to limit my printmaking sessions. So, that's what I do. I allow myself the length of one whole CD to print. Then I need to stop. Enough. The first day I got back into it, even after a whole CDs worth or printmaking, I ended up with pure garbage. Nothing worth keeping. That's OK. That's how life is sometimes. However, on Sunday, with Eric accompanying me once again, I had a few prints that I consider successful. The print pictured above is one that I am happy with and plan to keep for myself. 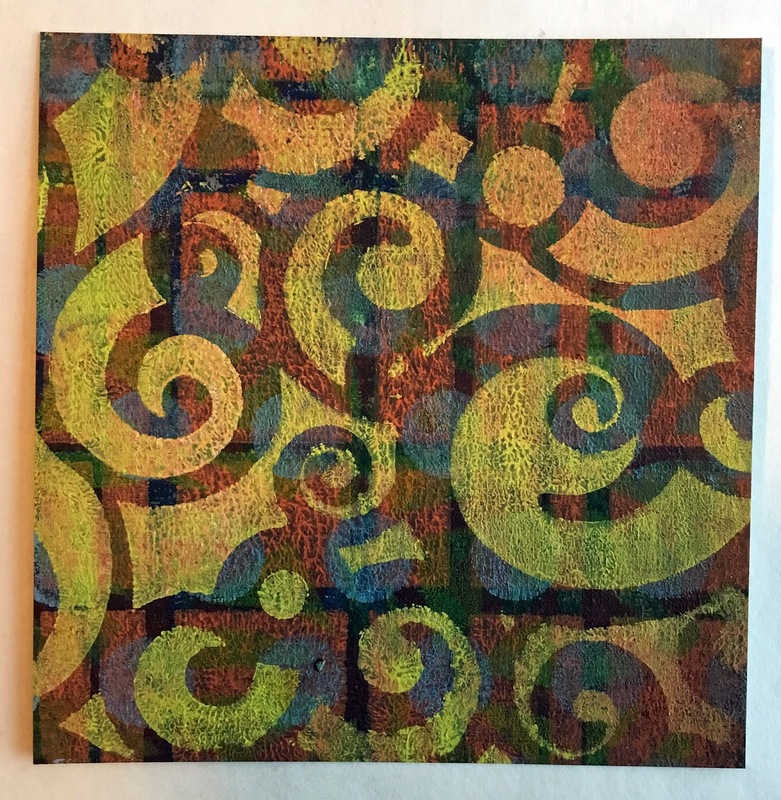 Do any of you do Gelli Plate printing? If so, what is your favorite size of plate to create with? What is your favorite medium? Do you use your flat hand to rub to make the print? Do you have any questions about Gelli Plate printing? It is so nice to be back in the saddle again . . .
Glad you are feeling better! I have not heard of this. Sounds very interesting. Thanks for sharing with SYC. I don't know what it is, but I am intrigued! Not a good way to spend the holidays! I actually have never heard of Gelli printing so if you do another post on it I would be interested! Thanks for sharing at Party in Your Pjs! I've never heard of Gelli printing either, but your print is beautiful! Exactly how do you do it? Thank you for linking up to Party in Your PJ's Linda, I always enjoy your posts. I pinned to my crafts board to remind me! There is a book "Art and Fear". The first chapters are really good and pertinent - they state creative people have to practice creativity on the way to making the 10% of the work that sings. Keep on!